Early medieval footwear of the Northwestern Caucasus: the finds from Moshchevaya Balka. The cliff-face tombs of Moshchevaya Balka high in the Caucasus Mountains have yielded rich grave goods and clothing, well preserved by the cold and arid climate. The cemetery is attributed to Alanic tribesfolk and was mainly used from the eighth to the tenth centuries. Much of what was excavated over seven decades in the 20th century, under more- or less-exacting conditions, has been collected in the Hermitage Museum, Saint Petersburg. The collection is remarkable for the profligate use of Asiatic silks, probably gleaned from traders passing along the local branch of the Silk Road, but among the less spectacular finds are fourteen items of footwear. All of the footwear from Moshchevaya Balka is of soft materials and without a seperately sewn-on sole, and has a fabric lining of raw linen which matches the form of the shoe and in many cases is sewn into it at the opening. Traces of grass stuffing still survive in one shoe - this form of insulation is very common among mountain dwellers of the Northern Caucasus to this day. As a rule footwear was made of tanned (also alum-tawed) goathide, rather thick but supple. Such shoe leather has been called yuft in Russia since ancient times. The hide is normally coloured black as a result of the manufacturing process - softening with chalk and clay, cleaning, tanning, greasing, drying, rolling, and scraping. Some childens shoes made of finer morocco leather (in one case calf, in another goat) were sometimes dyed red. All of the shoes are very carefully made - the cut is well thought out and precisely put together (Figure 1). Nevertheless, just as in more recent times they were probably homemade, not specialist craftsmans products. There is no distinction between shoes made for left or right feet. 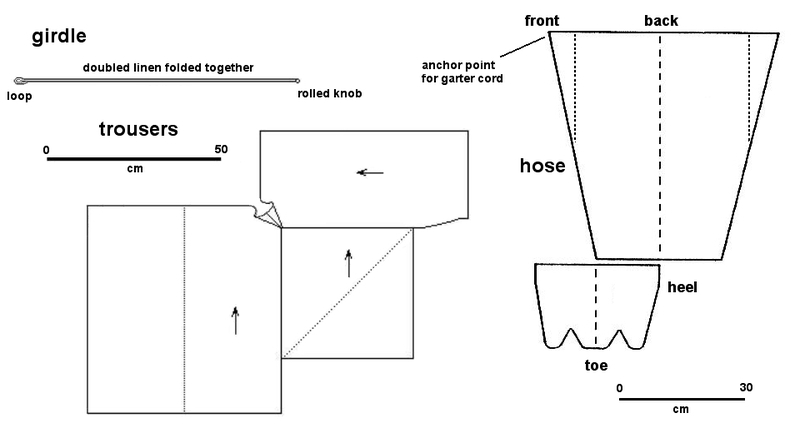 Figure 1 - General construction and pattern of Moshchevaya Balka footwear. Inset shows welted seam construction. Generally the footwear was made from a single piece of leather, with a central joining seam on the bottom of the foot incorporating a heel seam and running to the toe along the centerline of the sole. At the point of the shoe the main seam meets a short and curved cross-seam, here the toe is shaped by neatly gathering the leather in small folds. There are three examples where the main seam runs instead down the upper side of the foot - at the point of the shoe it also strikes a cross-seam, which is curved however in the other direction . Joins are frequently decoratively strengthened by welting (Figure 1) - a thin strip of leather folded in half was sewn into the seam, appearing as piping on the outside. 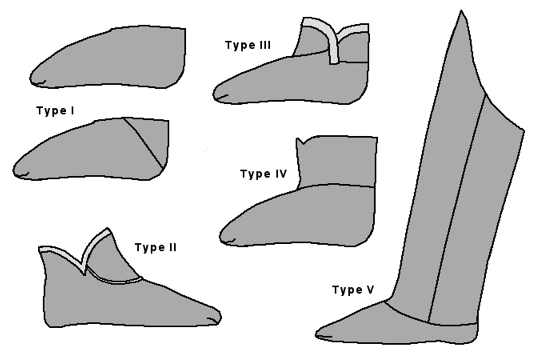 Five styles of footwear are present in the Hermitage collection (Figure 2), but in most cases (i.e. those derived from undocumented excavations) particular examples could only be tentatively attributed to either male or female wearers on the basis of size. They resemble the footwear of modern Caucasian mountain-dwellers - low shoes known as chuvjaken, and soft boots. Figure 2 - Types of shoes found at Moshchevaya Balka . Probably used by women and children only, the foot opening is simply cut below the ankle level, barely covering the instep. The main seam runs along the sole, with the exception of one childs shoe which has a vamp seam . 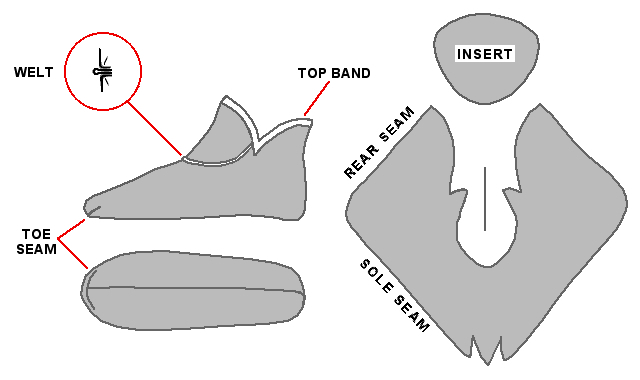 Some are made entirely of one piece of leather, and others have an extra piece joined to make the back part of the shoe (Figure 3). In one female grave Type 1 slippers were furnished with short felt leggings (footless stockings of felt, fabric or leather called nogowitsas are common in the Caucasus). From this one can probably conclude that such leggings were worn with low slippers in other cases. There are some items resembling cloth liners for Type 1 shoes, but which are unassociated with any shoe. Those with a properly hemmed upper edge, particularly ones decorated with a silk border, are probably not actually linings but really stand-alone items of footwear. They might have been used as special burial footwear, in the Caucasus however fabric shoes are also very commonly worn inside the house. 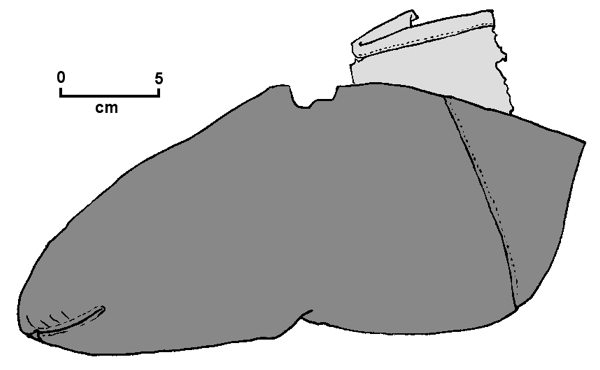 Figure 3 - Type 1 shoe with felt sock  from female grave, now flattened. Three examples of this type were found (Figure 4). Their size suggests that these are womens shoes. The main part is a single piece of leather with the seam under the sole. A roughly semicircular insert is attached to the upper edge of the vamp (Figure 1). In one of the shoes it is covered with silk. The upper edge of the quarters  is similarly cut half-round, but somewhat lower. These semicircular margins meet in V-shaped notches at the sides, and the entire upper edge is trimmed with a samitium  silk border. Inside these shoes are furnished with raw linen linings that are sewn-in over the instep. Figure 4 - Type 2 shoe with linen liner and silk top band . Now flattened and the vamp is missing, apart from its linen lining which reproduces its form - note the sole and toe seams. This form is represented by a single example, a childs shoe in red goatskin which belonged to a 8 or 9 year old (Figure 5). The shoe is of similar height to Type 2, covering the arch and part of the ankle. The main seam goes along the middle of the sole and the heel. It has a short two piece shaft: one approximately semi-circular leather piece is sewn to the quarters, and a second is set forward on the vamp, the inserts overlap at the sides. The upper edge of the shoe is trimmed with a folded strip of samitium silk fabric bearing the characteristic Sogdian double-axe pattern. Inside a coarse linen lining survives, which is sewn in around the edges. 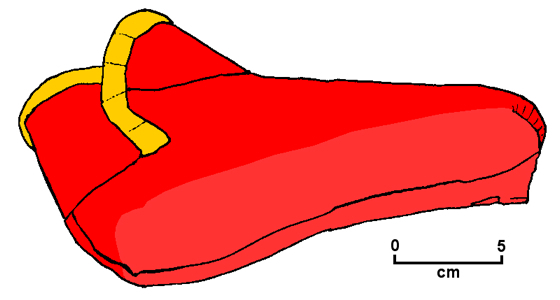 Figure 5 - Childs shoe  of type 3, partly reconstructed into original three-dimensional form. Note silk border which is fitted to the curves with small tucks. One pair of these were discovered, in a female grave . One shoe contained a fragment from a felt nogowitsa. The lower part is made from a single piece of brown leather with a sole seam and a straight-cut edge, to which a low shaft is sewn. The boot opening comes to a V at the front. The overall height (16.5cm) is such that that the ankle was completely covered by these shoes. 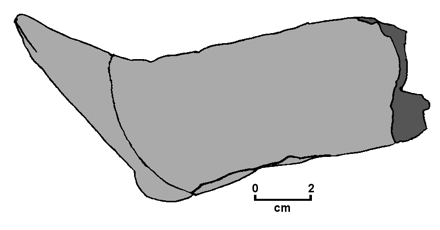 Figure 6 - Dolls boot from Moshchevaya Balka . Note rear seam on shaft. A miniature dolls boot (Figure 6) shows the overall appearance of this type, but there is only one item that can be recognised as an actual mans boot . Made from black leather with a sole seam, the upper part is missing above 19cm, yet it is possible to reconstruct it from its lining of raw linen  to a height of least 32cm, thus covering a large part of the lower leg. The shaft is attached to the foot with an ornamental seam; and is made of two parts joined by lengthways seams towards the front. 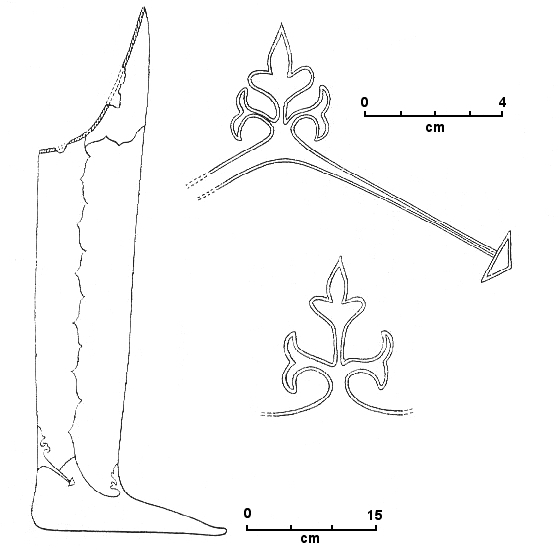 Figure 7 - Boot from Chasaut cemetary, details of decorative seams and appliques. After Runich, fig. 6. Male and female lower garments were similar: short loose-fitting linen trousers tucked into thigh-high linen  stockings (Figure 8). These normally had feet, constructed similarly to the Type 1 footwear described above, made of a coarser grade of linen than the legs. Some however were footless, secured with a strap sewn under the arch. While womens stockings could be made of a single width of cloth , mens stockings were made wider with wedge-shaped gores in the forward-facing seam . Mens and womens stockings were fastened in distinct ways: those of women were bound below the knee with 2-3cm wide strips of linen, and mens were held up by garter cords that were fastened to the narrow cloth belt that held up the trousers (Figure 8, left above). The garter was fixed through a small hole in the upper edge, reinforced with a leather grommet. Figure 8 - Leggings: left, short trousers and girdle ; right, hose  (hose after Kajitani). The footwear of Moshchevaya Balka is of several different styles, but of a uniform construction poorly suited to outdoor walking. Though this may reflect the equestrian nature of Alanic society, it is perhaps more likely that custom required burial dressed in indoor shoes - perhaps to discourage the corpse from wandering, or in belief that the tomb was the new home of the deceased. A.A. Ierusalimskaja, Die Gräber der Moshchevaja Balka: Frühmittelalterliche Funde an der Nordkaukasischen Seidenstrasse. Editio Maris, Munich 1996. A.A. Ierusalimskaja and B. Borkopp, Von China nach Byzanz: Frühmittelalterliche Seiden aus der Staatlichen Ermitage Sankt Petersburg. Bavarian National Museum and State Hermitage, Munich 1996. N. Kajitani (2001). A mans kaftan and leggings from the North Caucasus of the eighth to tenth century: A conservators report. Metropolitan Museum Journal 36, 85-124. P. Linscheid. Gaiters from Antinoopolis in the Museum für Byzantinische Kunst Berlin. In: C. Fluck & G. Vogelsang-Eastwood (eds.) Riding Costume in Egypt: Origin and Appearance, p.153-161. Brill, Leiden 2004. A.P. Runich (1971). Skalnye zakhnenija v okrestnostjakh Kislovodska. Sovetskaja Arkheologia 1971(2), 167-178. Form of the footwear is however not affected by the choice of main seam position. Study of footwear of modern Caucasian tribes suggest seam placement is determined by cultural tradition, and having both variants at this site may include shoes among other indicators of ethnic mixing in the early medieval Northern Caucasus. As no photographs of Types 4 and 5 footwear were available, their drawings are hypothetical constructs based mainly on text descriptions. PB. Vamp: the front part of a shoe, covering the upper surface of the instep and toes. PB. Kz 6705. Slippers (pair) from female tomb I/8. L. 27cm, h. 16cm. Construction - thick black goat leather; sole seam; triangular heel insert. Opening cut level with the instep, no top band. Fragments of short leggings of woolen felt (h. 20cm) survive, the top edge hemmed outwards. Quarters: the rear part of a shoe, enclosing the ankle and heel. PB. Samitium: weft-faced silk twill with a figured weave in complex, often multicoloured designs. Famously produced in Byzantium, but also in other Eastern textile centres, notably in this case the Sogdian realm based around Samarkhand. From Greek: hexamitos. PB. Kz 4866 & 4699. Slippers (pair). L. 24cm. Construction - black leather; sole seam, stitch interval about 3.5mm, ?welted; semicircular insert over vamp; silk top band of light-colored samitium. Sewn-in raw linen lining with raw edges of construction seams turned outward. Kz 6712. Slipper from boys tomb I/4. L. 22cm, h. 14cm. Construction - fine red goatskin; sole seam; semicircular inserts over both vamp and quarters with top bands of folded-together silk strips - Sogdian samitium with pattern of double-axe medallions, now beige and brown. Lining of coarse linen, sewn in at the upper edge. Kz 6645 & 6646. Half-boots (pair) from female tomb I/1. H. 16cm. Construction - brown leather; sole seam. Surviving fragment of felt legging in one shoe. Kz 6718. Boot for a doll. L. 9.5cm, h. 14cm. Construction - black leather; sole seam; one piece shaft with rearward seam. Kz 6719. Boots (fragmentary). H. (remaining) 19cm, l. (remaining) 19cm. Construction - black leather; sole seam; only lower parts of shaft remain but the raw linen lining survives to height of 32cm. It is quite possible that some short linen stockings recovered from Moshchevaya Balka were actually boot linings. Preserved in the State Historical Museum in Moscow. Utilitarian stockings are wholly of linen, but a showier example made of silk is held by the Metropolitan Museum, New York (see note 18 below), and attributed to Moshchevaya Balka. It was probably worn over a plain pair. It seems the loom width of linen used at Moshchevaya Balka was quite narrow, at around 50cm. Imported fabrics such as silks were not restricted in this way. PB. 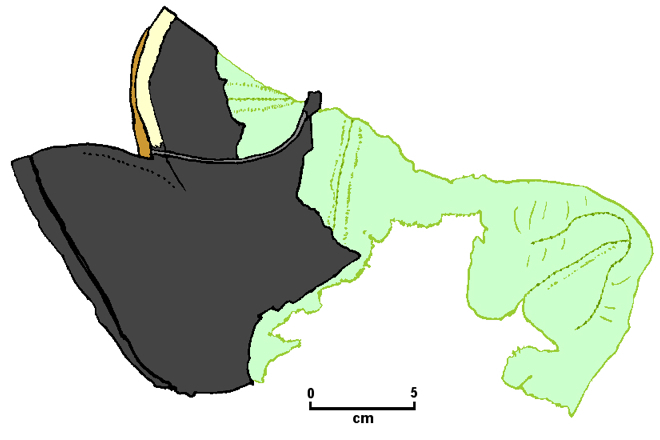 Some Sassanian stockings found at Antinoopolis, Egypt were of similar form with a gusset inserted in the joining seam - which was however at the rear, rather than the front. See Linscheid, fig. 64. Trousers and girdle: Kz 6702, from female tomb I/8. Linen, leg (max.) 60.5cm; waist 112cm; girdle l. 82cm. Legs folded squares; between a wide gusset made from a smaller, diagonally folded square. Girdle a folded-together linen strip formed into a loop on one end and a knob on the other. Hose: Metropolitan Museum 1996.78 2a-b. Decorative outer hose (pair) - height 81cm; upper edge 59cm; 32cm ankle; foot l. 24cm. Leg section with front seam, samitium silk rondel-pattern in brown, red, yellow & blue; inside a linen strip reinforces upper margin; in front a round leather grommet is sewn through both layers. Note - the gussets marked on the pattern are representative (for the male version of this garment) but are not actually separate pieces in this example. Foot of linen, with sole seam and shaping seams. Early Medieval Footwear from Moshchevaya Balka, written and webbed by Peter Beatson. (c) Birka Traders 2008. Not to be copied without permission.